Check-in attendees at the door and help the garden owner with other tasks. Please arrive 30 minutes before the event. You will receive an email with more instructions before the event. 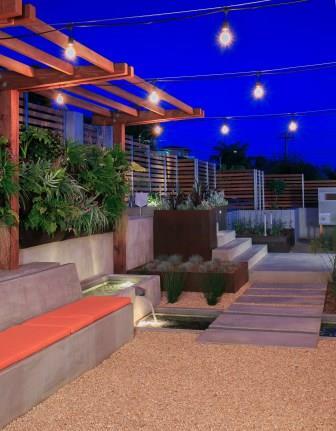 The November Featured Garden is a recently completed modern urban landscape. The remodel of this contemporary garden was just completed last March after 8 months work. The corner sloped lot had 50 year old buckling retaining walls and there was no place where the kids could safely play outside without crumbling concrete and rebar. Much of the space was unusable. The new garden utilizes all of the space with lots of different elements. Envision Landscape Studio helped create this complicated design. Leveling and retaining the property took half of the time and budget! The remodel incorporates the following elements: a new driveway, a fence encircling the entire property, an infinity pool, deck, prefab structure by Modern Shed that functions as a gym, kitchen, fountain, rain barrels, living wall, fruit trees, raised vegetable beds, a chicken coop and run, and an outdoor shower. There are 11 different drip irrigation zones that are controlled by phone. The furniture is made of recycled milk jugs. Today, they garden almost every day. Meals are planned around the eggs, tomatoes, eggplant, cucumbers, peas, artichokes, strawberries, onions, leeks, watermelon, lemons, corn, lettuce, passion fruit, peppers and herbs they harvest. 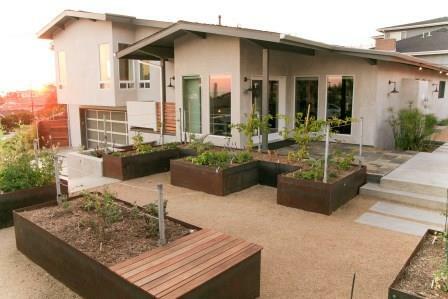 The owners refer to it as their modern urban farm.